Samsung galaxy S is considered as one of the most successful Android smartphone currently available in the market. Samsung today added another member to the Galaxy S family by announcing Samsung Galaxy S2 at MWC in Barcelona. The pictures and specifications of Samsung Galaxy S2 were leaked much before the official announcement. The device has a very thin external casing in which it holds a 4.3 inch Super AMOLED + display with 800 x 480 pixels resolution. The original Galaxy S created a history in the Android smartphone segment with the first ever AMOLED display. An AMOLED display provides better screen clarity and brightness at lower power consumption rates. The display has improved a lot in Samsung Galaxy S2 with the introduction of AMOLED Plus. 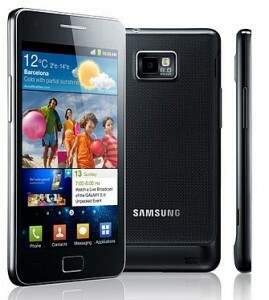 Samsung Galaxy S2 is internally powered by a dual-core 1GHz Samsung CPU and around 1GB of RAM. On the software side, it has Android OS 2.3 Gingerbread with Samsung’s latest TouchWiz 4.0 UI over Android. The new TouchWiz comes with inbuilt Samsung Hubs for social media, multimedia, gaming, reading and other activities. The Camera in Galaxy S2 is 8MP, and it supports HD shooting at 1080p also there is a front camera of 2Mp quality. Samsung Galaxy S2 will be available in 16GB/32GB storage options and in Black color. Other specifications of Samsung Galaxy S2 includes Bluetooth 3.0, NFC support, HDMI, A-GPS, Li-Ion 1650 mAh battery, Wi-Fi 802.11 a/b/g/n, Google applications, etc. Samsung will launch Galaxy S2 in selected European and Asian countries by the end of this month, February. There is no word on the pricing or North American launch date. But regarding the price we hope that it will available at the usual smartphone plan@ $199 in USA, and each carrier would get their own Galaxy S2 versions. The fully unlocked Samsung Galaxy S2 model would cost anything between $650-$750.